This is another recipe from The River Cottage Baby and Toddler Cookbook by Nikki Duffy. I was really pleased to receive a promotional copy of this book and I am just loving it. 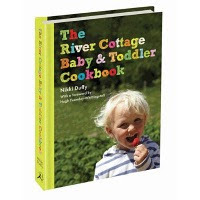 Nikki, a mother of three herself, works at River Cottage and was able to take their ethos and combine it with her own common sense methods to come up with some great recipes and some very sound advice. She did also work with a paediatric dietitian when researching for this book, to make sure she got it right. It is so easy to open this open and be inspired. I wanted to make a new dish for Cooper and was swithering between this and the Veggie Bean Curry, so I let Graham have his say and he plumped for this one. I think he was hoping he would get a slice too. An easy and tasty seasonal tart that will delight both children and adults. Preheat the oven to 190c / gas 5. Grease a baking tray or line with a non-stick liner. If the spinach is mature, tear out any tough stalks. Wash the spinach thoroughly, then pack it, with just the water that clings to it, into a saucepan. Cover, put over a medium heat and wilt the spinach in it's own liquid - this takes only a few minutes. Drain and leave in a colander to cool. When cool enough to handle, squeeze out as much liquid as you can with your hands, then chop the spinach roughly. Meanwhile, heat the oil in a frying pan over a medium heat. Add the onion and cook gently, stirring often, for 10-15 minutes, until really soft and golden. Add the garlic for the last few minutes. Add the thyme leaves, then the chopped spinach, season if you like. Roll out the puff pastry on a lightly floured surface to a square about 5mm thick, and lift onto the baking tray. Spread the spinach mix over the pastry, leaving a margin along the edges. Scatter over the grated cheese and bake for 15-20 minutes or until the pastry has puffed and golden, and the cheese is turning golden too. Serve warm or cold. I wash my spinach in a colander and then pour a kettle worth of boiling water over the spinach to wilt it. I feel there is no need for a pot. I also used dried thyme as I didn't have any fresh thyme. As you can see Cooper enjoyed his slice of tart and he very kindly shared it with us. It was extremely yummy and gorgeous cold the next day too. Cooper enjoyed it another night with vegetables and beans. We will be making it again soon. Tell Cooper to save some for me. What a great summer dish. This looks absolutely delicious! I think you can always rely on the River Cottage Books! We use them a lot. Looks lovely - my first thought was how nice it would be cold for a picnic...if it ever stops raining! Hey Johanna, It saves the bother of using a pot and wilts the spinach really quickly, I did forget to say, to give it a squoosh of cold water, before squeezing it out. Hi Jerry, it is lovely and so simple. I liked it even better the next day cold. This is my first of their books Adam and Theresa, but i think I will be purchasing more. I know, the rain is dreadful CC. I has rained here solidly for longer than I care to remember. It would be great for a picnic. Hope the sun comes out soon. Puff pastry tarts are the business! 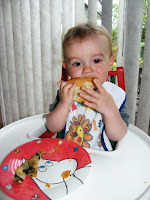 but forget the tart, I love Cooper's Moomin plate! Cooper is a very lucky baby being fed such delightful food! The tart looks delicious, not surprised your Graham was hoping to eat some as well! Looks quite yummy! Hello to Cooper! We nearly had it tonight again Chele, but had a stirfry instead. Will keep it for another night. Oh! That looks just delicious! I love spinach and cheese together; and puff pastry always is a great base for yummy ingredients. Ps. Great idea about wilting corriander without a pot. Will use that next time! 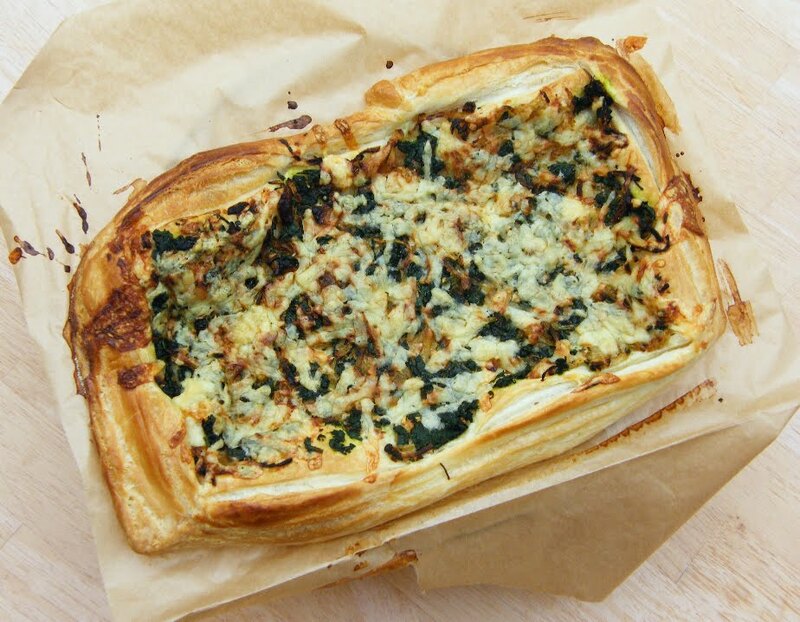 The tart looks absolutely stunning, so yummy with the onions, spinach, cheese and the perfectly puffed pastry! And Cooper looks so cute munching on it. I'm jolly glad poor Graham got a look in after all - the tart sounds delicious and this looks like another good book to have around. Great combo! Putting it on top of puff pastry tops it off. We had some last night again TB, but I added some pesto to the base. I haven't tried this one yet but will have to next time I get spinach in my veg box. That looks like a really delicious tart, a perfect dinner! Glad Cooper enjoyed it and that you and Graham got a look in too. 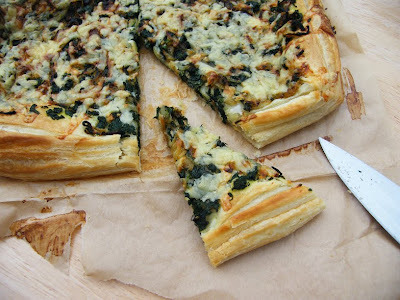 Flaky layers, spinach and cheese,,I'm in.